As the weather cools down hunters transition from their early season upland hunting vests to warmer, late season gear. While we as upland hunters don’t bundle up quite as much as deer hunters, we certainly do prefer a slightly heavier upland hunting jacket. A reasonably priced pheasant hunting jacket will go a long ways as the temperature drops. This way you can stay nice and comfortable while watching your bird dog work through the grouse woods or sorghum in search of the next bird. Here at Upland Hunter, we’re fully aware that a good upland hunting coat can make for an enjoyable day in the field. Purchase a bad one though, and you can end up soaked or even end up accidentally losing an entire pocket of shotgun shells. That’s why we took it upon ourselves to look for the best upland jacket on the market in 2018 for each hunting scenario. So without further ado, here is our list of the best upland hunting jackets of 2018! If you’re looking for the best upland hunting jacket on the market in 2018, look no further. 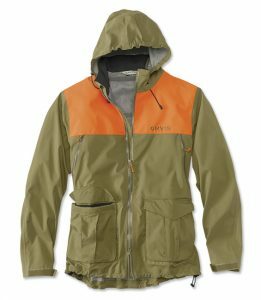 Orvis knocked it out of the park with their Toughshell Upland Jacket. Featuring a waterproof and windproof construction & some seriously well thought out features, this is your best bet. Well known for quality gear for since 1856, Orvis is one of the go-to brands of upland hunting enthusiasts. 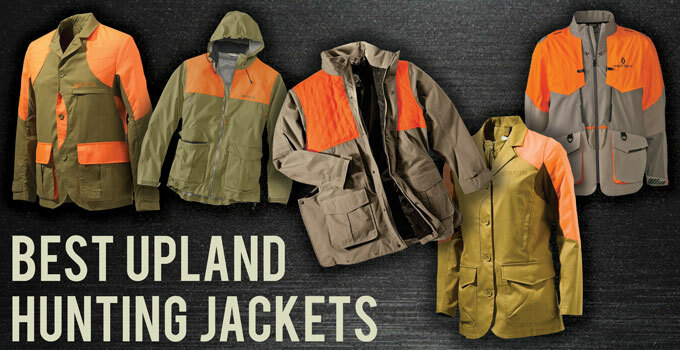 The Toughshell waterproof upland hunting jacket is loaded with some great features. It’s the only jacket on this list with a hood at all, and we aren’t talking about a bulky hood that gets in the way. Orvis designed a well-fitting, adjustable hood that will keep you comfortable & dry. There are also ventilation areas in the under arms which can be opened or closed with a zipper. Normally we aren’t a fan of zippers in high flexibility areas like this. However Orvis did a great job adding this feature without sacrificing mobility. The pockets don’t originally look like much, but upon closer inspection they’re excellent. Featuring an integrated magnet system to hold the pockets open or closed, these are pretty neat. There are also zippered hand warmer pockets beneath the shell pockets. This was a great idea, as most jackets don’t incorporate this. The game pouch is more streamlined than most other jackets you’ll see. While it originally looks like it wouldn’t be able to handle too many birds, it’s surprisingly large. You won’t have a hard time squeezing 4 or 5 roosters into the back of this jacket. The pouch also zips up, so you don’t have to worry about losing any birds or bringing half the woods back home with you. Just like other upland vests & jackets, Orvis uses a blood-proof lining for their game pouch. Click here to check the current price! We had to include a few Cabelas hunting jackets on our list, and since the matching upland pants made the top of our list of the best brush pants of 2018, it was inevitable that this jacket would show up here. Featuring Cabelas 4Most Dry Plus technology, the men’s performance upland coat is 100% waterproof to keep you dry on those snowy days. The exterior is also constructed from Infinity Fieldcloth, which drys very quickly. Rounding out the exterior features of this pheasant hunting jacket is the blaze orange acrylic shoulders to make shouldering your shotgun that much easier. The interior of this pheasant hunting jacket has everything you would want & more. The game pouch features a blood-proof lining to keep your upland shirt nice and clean. It also has access through the front, side, & rear meaning that you can stuff birds back there relatively easily. What about storage you ask? Besides the massive game pouch there are also two sizable front pockets with snaps to keep your gear secure. All things considered, this is a great pheasant hunting jacket that all upland hunters can appreciate. It doesn’t feel cheaply made, and definitely gets the job done in the field! While it’s certainly not inexpensive, it also won’t break the bank like some other higher end upland jackets will. While we wish this were the case, there are significantly fewer options for women’s upland hunting coats than there are for men. Thankfully this doesn’t mean that there aren’t quality options though, and this Beretta women’s upland jacket is a great example of that. Coming in a significantly more fitted style than men’s versions of Cabelas upland jackets, this upland hunting coat does it all. It features a 98/2 cotton to spandex construction ratio. This means that this women’s upland hunting jacket will flex a bit when shouldering your gun. There are even some armpit ventilation holes to give you breathability when you’re hiking through the field. There is a double entrance game pouch, which also features the typical blood-proof lining. 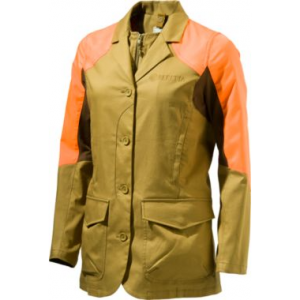 This women’s upland hunting jacket is also water resistant, which will help keep you dry all day long out in the field! We’re pleased to say that this is clearly one of the best women’s upland hunting coats on the market in 2018, and you certainly won’t be disappointed with it! From the Cabelas Prairie Runner line comes the Instinct Men’s Prairie Runner Coat. This coat is specifically made to be a higher end performance upland hunting jacket than the one listed above. Again featuring the waterproof & breathable 4MOST Dry-Plus technology, this is a slightly more fitted version of the performance coat. Much like the Beretta women’s upland coat, this upland hunting jacket features flexible panels to make shouldering your shotgun easier than ever. Those of us that have gotten snagged in the grouse woods can appreciate this feature for sure! Related: Shop IWB Holsters For Your Every Day Carry! 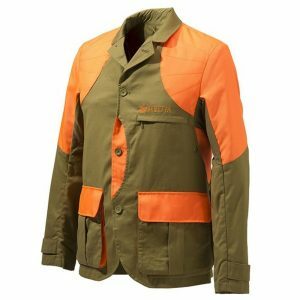 Another added bonus that some hunters will appreciate is the ability to incorporate a water bladder with this upland hunting jacket. It’s a well thought out design that involves a separate pouch on your back. The drinking hose can then route through the top of the pouch and snap into place over either shoulder. This is great so you won’t be buying a left or right handed jacket just for a water bladder. It’s worth noting that this hydration bladder is sold separately, but it’s still a great option to have. So if you’re looking to upgrade a bit without completely breaking the bank, Cabelas Instinct Men’s Prairie Runner Coat is a great option! This jacket shouldn’t come as much of a surprise here since the women’s version was voted best women’s upland jacket. The Beretta Men’s Upland Jacket is the perfect combination of light insulation, flexibility, fit, & function. The construction is very similar to the women’s jacket with flexible underarm patches, ventilation etc. If you’re looking for a tighter fitting, slender jacket this is definitely the one for you! There is a double entrance game pouch, which also features the typical blood-proof lining. This upland jacket is also water resistant, which will help keep you dry all day long out in the field! We’re pleased to say that this is clearly one of the best upland jackets on the market in 2018, and you certainly won’t be disappointed with it. 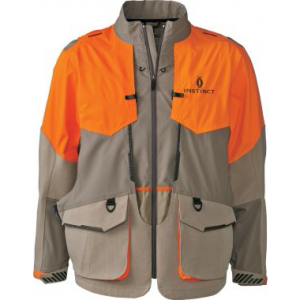 What Do We Look For In Upland Hunting Jackets? With so many options for pheasant hunting jackets & upland coats out there, it’s important to note what to look for in a good one. Like anything else, companies claim all sorts of grand features that sometimes don’t actually mean anything. Oftentimes these features & “technologies” are just one brand’s proprietary way of claiming a feature, while other brands use a different term. We’ll help sort through which of these “technologies” are worth investing a bit more money into & which should be left on the sales rack at the store. It Has To Fit Well! This is probably the most important factor on this list. We would rather hunt in a jacket that fits well & a backpack for carrying birds than a specific upland hunting jacket that is ill fitting. The main areas to note with this are the hips and the shoulders. An upland hunting jacket that fits properly is going to allow you to bring your gun up without getting in the way at all. With as fast as these upland birds are, every fraction of a second counts. The last thing you want is the recoil pad of your shotgun to get caught up in a loose fitting jacket. The torso of the jacket shouldn’t be skin tight, but it should at the very least be fitted for your body type. Remember that a pheasant hunting jacket that fits a short, skinny person might not fit you as well if you’re of the big & tall variety. There’s nothing wrong with that, just know that you can probably ignore the advice of people that fall far outside your body type. Take your time & be picky about the fit of your jacket. You’ll thank yourself later! This point really hits home for me. The last upland hunting coat I had super loose pockets that would frequently lose whatever they were carrying. I’m not exaggerating when I say that I lost multiple pockets of shotgun shells, the remote for my dog’s e-collar, & even my GPS that I used for hunting. When I originally bought the jacket I went based on the brand name. I won’t mention the brand here, but just know that it was a large brand that didn’t make the list based on my experience with them. I always look for tighter pockets now, preferably with either 2 or 3 snaps or ideally velcro closures. Jackets that only have a single snap on the pocket are a good way to lose all your gear. Another thing that is probably just a preference is dedicated shell holding loops. These make grabbing a few more shells in a hurry especially easy, & also help hold your shotgun shells nice and secure. For some reason upland hunting jackets don’t seem to incorporate these as much as upland vests do, but they are still nice to have. I tried to save some money when I bought my previous jacket, and it cost me in the end. The $50 that I saved up front ended up costing me well over $350 in lost gear. Hopefully you can learn from my mistakes, and not make them yourself! 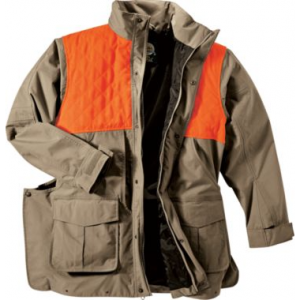 You probably noticed I mostly included lighter weight pheasant hunting jackets on this list. That wasn’t by accident, and believe me you’ll appreciate it later. When it comes to upland hunting, layering is key. You want to be able to shed layers after walking a few miles in order to regulate your body heat a bit. If you were to opt for a heavy duty upland jacket, you’re going to be sweating bullets by the time you’re done with your hunt. The best upland hunting jackets in my opinion are going to be fitted, but still leave room for layering. I typically wear my brush pants, an undershirt, my upland hunting shirt, and then my jacket. When I get too warm I’ll take off either my undershirt or my upland shirt, and from then on I’ll be perfect. There is very little that can ruin a hunt as fast as being uncomfortable, so opt for layers! The game pouch is obviously a primary feature of the upland hunting coat. The last thing you want to do is have to hunt all day with a fist full of roosters. One often underestimated aspect though is how the size of the game pouch needs to align with your hunting style. Someone looking for a pheasant hunting jacket is going to need significantly more space than someone hunting quail. Knowing what you’re going to be hunting is key to enjoying your upland jacket purchase, not being frustrated with it. Assess what you’re going to be hunting, and make your buying decision based on that. Quail hunters don’t need the biggest game pouch in the world, while pheasant hunters want a larger pouch. There isn’t a right or wrong answer here, simply a matter of personal preference for each and every one of us! Choose correctly & there shouldn’t be any frustration between shooting the bird & sealing it up with your vacuum sealer! If you’re out in a pheasant field or cutting across the prairie during late season, chances are you’re going to be exposed to quite a bit of wind. In my opinion, the purpose of a good pheasant hunting jacket or upland hunting jacket is to cut the wind down. If you’re continually moving like most hunters are, this alone should keep you relatively warm. Striking a good balance between wind-blocking & breathability is key. There are so many things to love about this upland jacket that it’s to pick a single reason why it wins this award. It’s clear that hunters actually designed this jacket, and customers will appreciate the attention to detail. Whether you’re looking for an outstanding warranty or simply a great, tenured company, Orvis is the place to go. This jacket knocks down the wind better that the other jackets on the list, and the waterproof construction is very reliable. The integrated hood is better than most hoods on any hunting gear out there, and when not it use you can hardly even tell it is there. You’re certainly going to pay more with a company like Orvis, but in our opinion the extra money spent is well worth it. With Orvis you’re buying gear that is going to last decades, not simply years like many other brands.